AWFULLY HIGH! aka "It's Awfully High Around Here"
Perfect for the Mid-century Decorations. A Restaurant Pin-Up Model Waitress with coffee and doughnuts at Menue board at restaurant coffee shop. Her waitress uniform is the wrong size and up-skirt, it exposes her garters and full fashioned seamed nylons stockings. SEE PHOTOS 1, for a sample of this painting. Other paintings shown are available also on other listings. Please see photos and check my other listings or simply ask for a special one from my 100 IMAGE VANCAS/ELVGREN ART ARCHIVE. I will list and paint one for you. SALE this is a $4500 Painting. - 50% OFF - Now Offered at only $2250 ! This is a new commission for you, please allow 4-6 weeks for completion. Quality and satisfaction guaranteed! Order ASAP last time price reduction sale can end at any time. Since 1994 he is the First and Only fully authorized Elvgren replica artist! The larger or smaller size of this and/or any other images are available just ask and I'll paint it and list it for you. FIRST TIME! FIRST CHANCE! THIS PAINTING HAS NEVER OFFERED BEFORE! 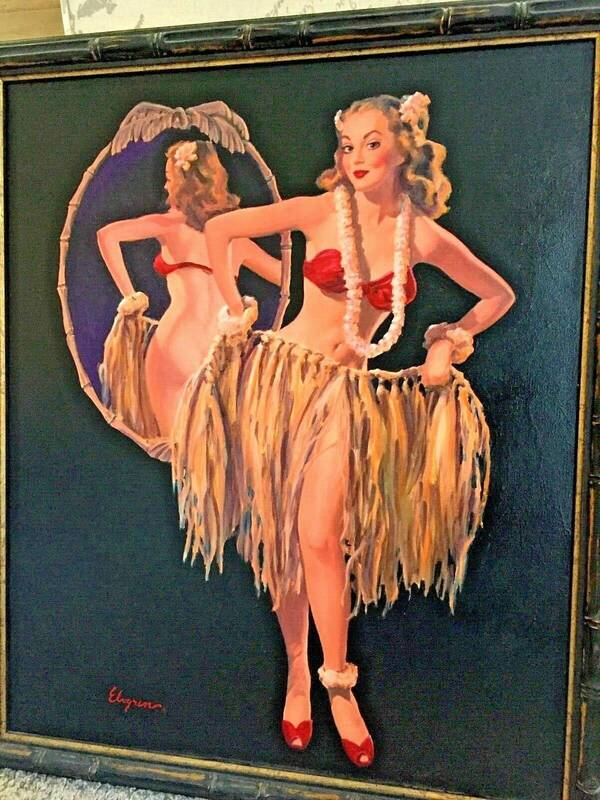 This original painting, a commission request was painted on the 1930's original Elvgren Easel that all of the Gil Elvgren pinups originals where painted on. Daniel Vancas recreates this art on the same Elvgren easel in the Vancas art studio. Your painting comes countersigned and dated on the front and/or reverse and fully photo documented on the artist's Elvgren easel in the Daniel Vancas California studio prior to shipping. The real deal and a Fully documented and only fully authorized replica painting. Ask about easy Lay-A-Way Plan! Official hand painted original Recreation painting by Daniel Vancas, (c) 1994 -2019 all rights res. ALLOW $-6 WEEKS FOR COMPLETION, PLUS DELIVERY. This is an original painting. Some slight and minor variations may be noticed and must be accepted as this is hand created art recreation. AND the ONLY ARTIST OWNING THE ELVGREN ART SIGNATURE BRAND AND ELVGREN EASEL. HURRY THIS IMAGE WILL BE RETIRED SOON! DON'T MISS THIS OPPORTUNITY TO OWN THE FIRST EVER RECREATION OFFERED HERE OF THIS IMAGE AND MOST POPULAR ICONIC ELVGREN IMAGE! ARTIST DANIEL VANCAS IS THE REAL DEAL! Elvgren tm is a signature art brand owned by Daniel Vancas, 1994 - 2015 all rights res. and is protected and backed by a signed Irrevocable Permanent Federal Court Order 2001. PLEASE DO NOT SUPPORT UNAUTHORIZED ARTISTS MILL SHOPS OR ARTIST WITH FAKE NAMES FROM PLACES LIKE CHINA AND/OR WITH FALSIFIED COUNTRY ORIGINS EVEN IF RESOLD IN THE USA WITH FAKE SOUNDING AMERICAN NAMES OF ARTISTS CAN'T BE CONFIRMED TO EXIST. 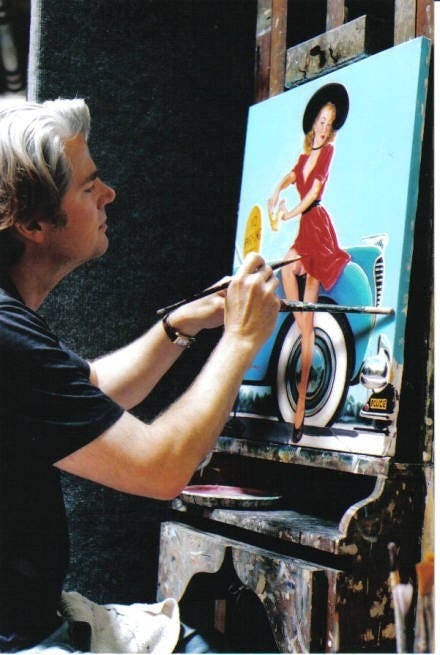 VANGUARD GALLERY FIRST OFFERED DANIEL VANCAS ARTWORKS IN 1992, HIS ELVGREN RECREATIONS FOLLOWED IN 1994/95. PAINTINGS BY DANIEL VANCAS IN 1995 HAVE STEADILY CLIMBED IN VALUE SINCE. IN 1995-96 THE ELVGREN REPLICAS WERE SOLD BETWEEN $1200 AND $2000 AND WERE RAISED TO $2500. GENERAL AGREEMENTS FOR COMMISSIONS: ALLOW 4-6 WEEKS OR MORE PLUS DRY AND SHIP TIME. SCHEDULE MAY BE DISRUPTED BY ILLNESS OR FAMILY EMERGENCY. OFTEN REPLICA PAINTING IMAGES AND TITLES WILL BE RETIRED. ART SHIPS ROLLED IN A TUBE. MOUNTING AND FRAMING OFFERED AND REQUIRES EXTRA COSTS AND FEES, PLUS ADDED SHIPPING COSTS. NOTE: PHOTO OF FINISHED WORK WILL BE SENT TO BUY BEFORE SHIPPING. ARTIST WILL EXCHANGE ONE TIME ONLY, NO CASH REFUNDS - SHOP VALUE OF EQUAL EXCHANGES (OR SHOP CREDIT) ONLY ON THIS AND ALL COMMISSION WORKS. HAVE A CUSTOM REQUEST? 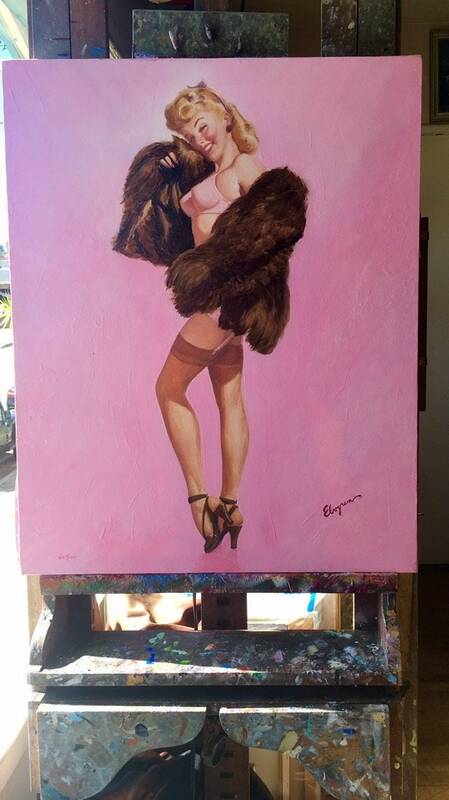 WANT TO BE A PINUP GIRL, OR HAVE ME PAINT A NEW CUSTOM ORIGINAL FOR YOU? WANT TO BECOME A RETRO STYLE PIN-UP CALENDAR GIRL FROM THE 1940'S OR 50'S? 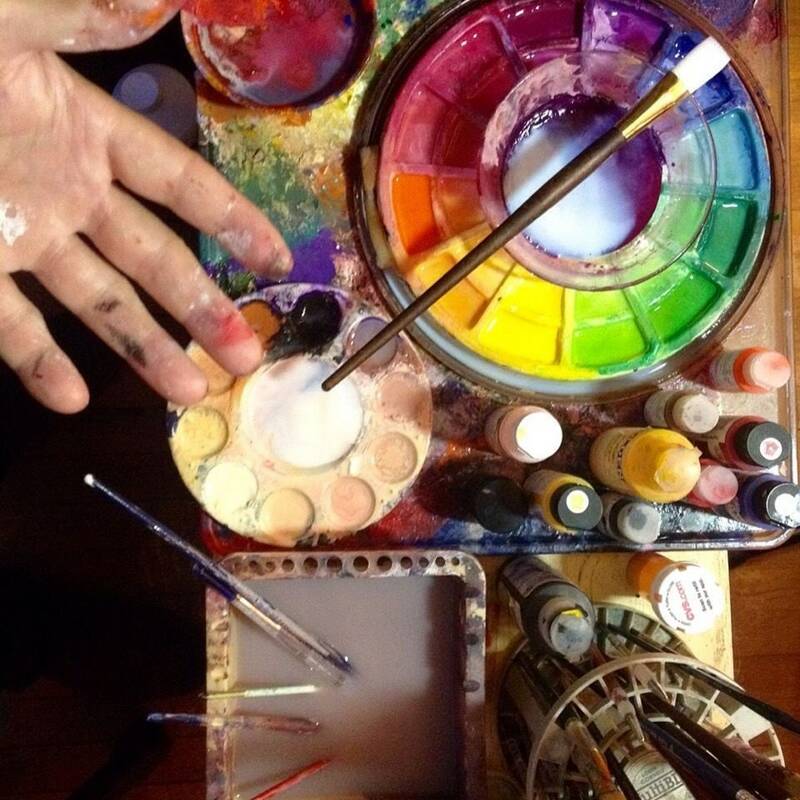 Notice: Our artists are not portraited artists. Pin-Up art is highly stylized and glamorized art form and not portrait art. if you want a portrait, please use a portrait artist, not a pin-up artist.